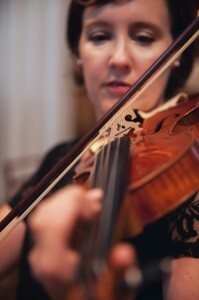 Christi Meyers has played a prominent role in the musical life of Victoria for over 15 years. She is the Assistant Concertmaster of the Victoria Symphony, a founding member of Victoria Baroque and the Odyssey String Quartet. She performs frequently with the Vancouver Symphony, Pacific Baroque Orchestra, Early Music Vancouver and has been been a leader or member of Sinfonia Rotterdam (NL), European Camerata (UK), and the Vancouver Opera Orchestra. A dedicated educator, Christi was for several years on faculty at UVic. She currently maintains a small private studio, is on faculty at the Victoria Conservatory and coaches the violins of the Greater Victoria Youth Orchestra. Christ has recorded chamber music for CBC television and radio and can be heard on several discs for ATMA and Marquis. Born in Montreal and raised in Grande Prairie, Alberta, Christi studied at McGill, Western, UVic and the Vancouver Academy of Music under the tutelage of Gwen Thompson, Sonia Jelinkova and Paul Kling.